Instead of a council of four or five like-minded individuals, Dubin, 62, says it’s time for someone with different experiences to get on board and help curb the “stagnation” at City Hall. Dubin’s name won’t appear on the ballot, but he’s pitching himself as a serious write-in candidate. Long known as a social activist, Dubin is the creator of the 9/11 memorial “Semper Memento” in Heisler Park and an oil painting, “Sandman” exhibited at Laguna Art Museum last summer, reflecting his view on Wall Street’s responsibility for the 2008 economic crash. But not all of Dubin’s work is controversial; he also recently built “Aliso,” an environmental sculpture of steel and mounded earth, which greets visitors arriving at the Ranch. The candidate also mentors young artists at Laguna College of Art and Design. “We’re not developing a young local art community,” he said. His reason for stepping up now to seek a spot on the council is the number of artist/friends he’s known over the years who have left Laguna Beach because of the lack of affordable studio space. Although zoning prohibits it today, he can recall a time when artists could have a kiln in their backyard or weld in their garage. “The city’s art community has been devastated by shifting demographics and [they’ve] been forced out due to rising real-estate values and lack of creative vision to help maintain a vital working artist population. We can’t be an art colony without artists,” he said. 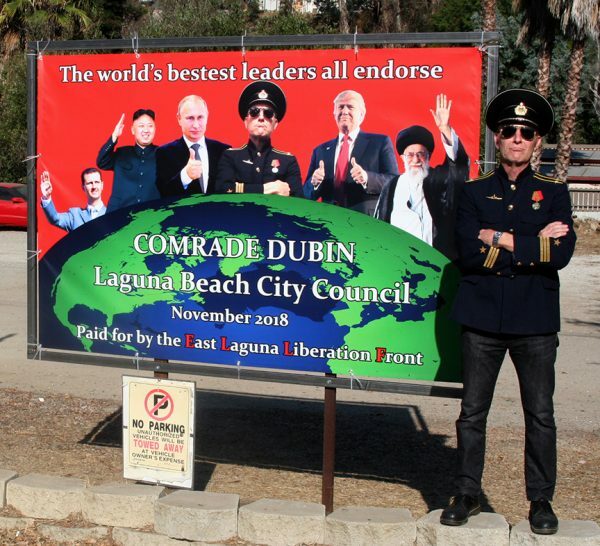 Dubin’s platform contains some ideas for strengthening Laguna’s identity as an art colony and coping with traffic congestion. Serving as his campaign manager is local artist Louis Longhi who, over the last 10 years has become known for his long battle to build live/work units for artists in the canyon. Dubin supports development in the canyon for artist’s use and advocates for making an official neighborhood known as the Artist’s District. “We want voters to understand that if a candidate is in support of responsible development it does not mean that they are trying to change the current building codes or exceed any height restrictions,” Longhi said. In order to revive the “sole and character” of Art Walk, Dubin would lobby for closing Forest Avenue and offering activities for kids, live music and art vendors as Santa Ana’s Art Walk does. To incentivize tourists to leave their cars outside the downtown area Dubin would like to see a more efficient shuttle system and designated tram lanes. He also thinks the city should entertain the idea of requiring non-residents to pay a day use fee for driving in the downtown area. The funds could be used to offset costs of developing live/work projects in the canyon he said. Dubin’s method for implementing his vision would incorporate the Japanese principal of Kaizen, which means change for the better. The 70 year-old concept is used in more than 60 countries around the world to implement continuous improvement in industry. It involves making a plan, implementing it, analyzing the results and making corrections. Dubin believes this goal-setting model, taken in small steps, could be applied to city government. Thank you Jorg for offering us a road less traveled.